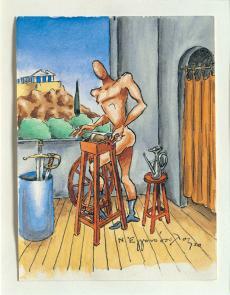 In the oil painting in the A. G. Leventis Gallery, dating from 1967, the artist was inspired by Greek mythology, a perennial source of imagery for him. 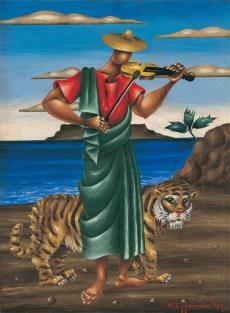 It depicts Orpheus, who enchants even wild animals with his music. 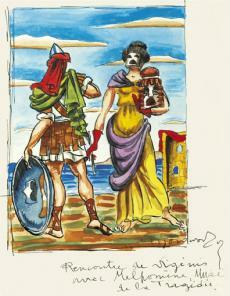 This mythical figure, alone or with Eurydice, preoccupied Engonopoulos in numerous variations from as early as the 1930s. 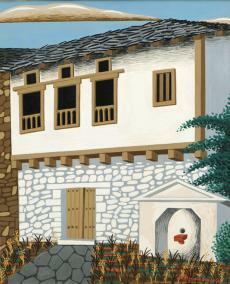 Part of a series of depictions of Greek buildings, an earlier tempera painting entitled Houses was produced in 1949.